I get all warm and fuzzy inside when I can grill outside for dinner without putting on my winter parka, and I’m happy to report that the time of special feelings is now. Our spring weather has been delightful for weeks and even though I feel a mild amount of guilt for having left all my friends behind in Northern Minnesota where they likely could have a blizzard any day still, I am taking full advantage of the sunny, balmy weather that basically screams grilling season is here. 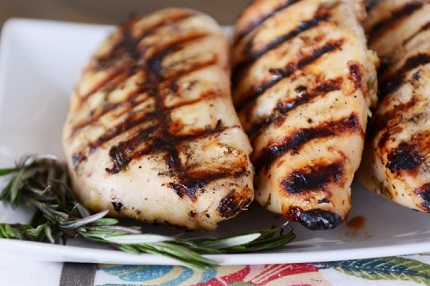 Even though I already have a few tried-and-true grilled chicken recipes, kind of my main go-tos, this grilled honey mustard rosemary chicken is so outstanding, I’m not sure I need any others — at least for the next few weeks (eventually my recipe obsession always gets the best of me). Tender and so delicious, this chicken has a crazy amount of flavor (thank you, rosemary, thank you) and is incredible with just a little sprinkle of fresh lemon juice before serving. Another huge perk? It’s versatile enough to be served with about a million different side dishes (I’ve narrowed a few down for you below because I know what it’s like to spend a hundred hours just searching for the right side dish). Fresh rosemary does me in every time (take this rustic rosemary bread for instance or this other buttermilk rosemary chicken) and this grilled chicken follows that pattern in a big way! 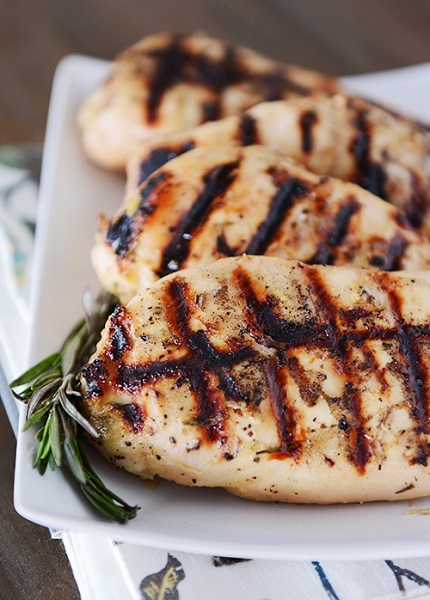 The chicken breasts (or thighs) can be served whole, or, like I sometimes do, they can be sliced after grilling into thin strips. It will probably depend on what you choose to serve with the chicken but slicing it up helps the servings to stretch a little bit (especially when feeding younger kids who probably won't eat a larger sized portion). If you don't have an outdoor propane or charcoal grill, you could try broiling (watch carefully!) or cooking in a hot skillet on the stovetop. Also, I think fresh rosemary elevates this chicken to extraordinary proportions but if you absolutely, positively cannot find or get your hands on fresh rosemary (do try, please do), 1-2 teaspoons of dried, chopped rosemary will work in a pinch. Whisk together the olive oil, mustard, honey, garlic, salt, pepper, and rosemary. Place the chicken in a gallon-size zipper bag and pour in the marinade. The mixture will be pretty thick; that's ok. Press out excess air, seal the bag and then gently mash the bag with your hands until the marinade mixture evenly coats the chicken. Refrigerate for at least one hour or up to 24 hours. Preheat an outdoor grill to about 350 degrees and cook the chicken for 6-7 minutes per side or until the internal temperature registers 165 degrees F on an instant-read thermometer. Tent with foil and let rest for 5 minutes. Drizzle fresh lemon juice over the chicken and serve (or serve the lemon wedges alongside).